A Few Good Men presents the reader with 10 positive role models from the Bible. From Obedient Noah to Loyal Onesiphorous, these character sketches combine dramatic story-telling with challenging and insightful comment. What kind of man do you want to be? Who do you admire? Rugged sportsmen, smooth film stars and wild rock musicians all compete for our admiration. But are these men the role models that we should aspire to be? Solidly founded on biblical narrative, these chapters will challenge and inspire readers to examine the struggles and temptations of these biblical men who face the same struggles that men still face today. 5" x 7.8" x 0.6"
Just to say this is not a proper review: I bought two copies for our two sons for Fathers Day, and one has already responded that it's good. I'll ask him if he'd like to write! Agree with previous reviewers, so want really to underscore their recommendations! Quite simply a great read for any man / guy / bloke / chap / lad seeking to lead a Christian life and encountering all the 'usual' pressures and challenges of day-to-day life. A series of thought provoking and readily applicable character studies in handy bite sized chunks. Currently on a special at just £4.19 this gem deserves to be made widely available and well read - buy it for your family and friends! Very pleased to recommend this book which I have used for a Men's Discipleship class. Great insight into bible characters and very useful topical application. One of the best resource books I have used. I've been looking for just this sort of book for some time now. 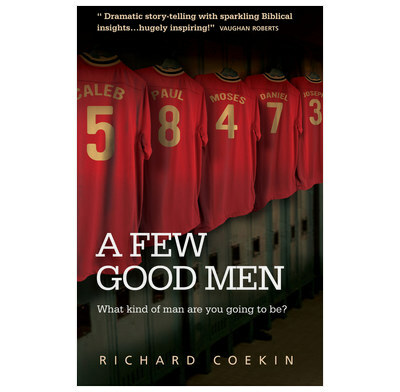 By looking at a series of well-known men of God from the pages of the Bible, Richard Coekin draws many parallels with the struggles of men today who are trying to follow Christ as best they can. The example of these men is a great encouragement, and there are lessons to learn from all of them. The book concludes by drawing together all the characteristics of these men into the man for all men, Jesus. Really thought provoking with questions for quiet time/joint study and practical suggestions for application, this book is a "must" for all men serious about being the man God made us to be. I've no intention of writing a review, but this has been a brilliant resource for reading through with a group of young Christian men from working class backgrounds with whom I meet to discuss a chapter each week at the pub! Try it yourself!